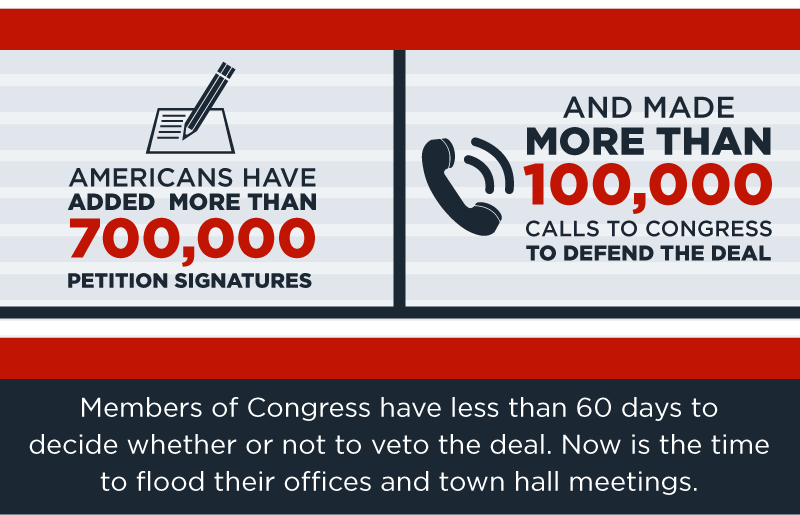 August is when members of Congress are supposed to be meeting with their constituents to discuss issues before them. 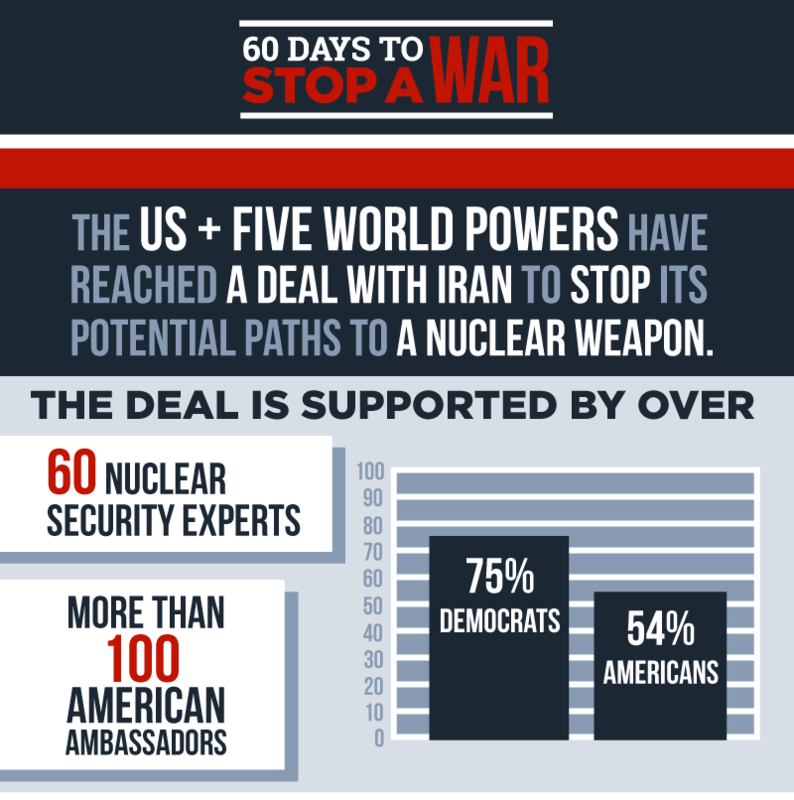 If you get a chance to attend such a meeting, please express your support for the Iran Deal and ask for your Senator’s and Congressman’s support. Do you remember Cory Remsburg? He’s the Army Ranger who received a standing ovation from Congress during President Barack Obama’s State of the Union address a few weeks ago. Applause is nice, especially from such influential people. It sure beats those cuts the Pentagon wants to make to veteran benefits. Defense Secretary Chuck Hagel is now trying to sell vets on his plan to scale back the number of U.S. troops, as well as what taxpayers are spending on active-duty and retired forces. After he announced his ideas, Hagel brought them straight to a town hall meeting with soldiers at Fort Eustis in Virginia. “There was no applause,” Military.com reported. Whenever Washington winds down its wars and our troops become needy veterans, interest in their welfare always flags. Senate Republicans just blocked a comprehensive $21 billion bill that would have beefed up veteran education, health, and other benefits. But that’s not all. Food stamps were just cut for some 170,000 vets, pensions will soon decline, and the Department of Veterans Affairs admits a backlog of 393,000 benefit claims after making great progress toward getting caught up. About 30 percent of the vets who serve in war zones return from the battlefield with undiagnosed or untreated post-traumatic stress disorder. Some half a million are suffering from it now. 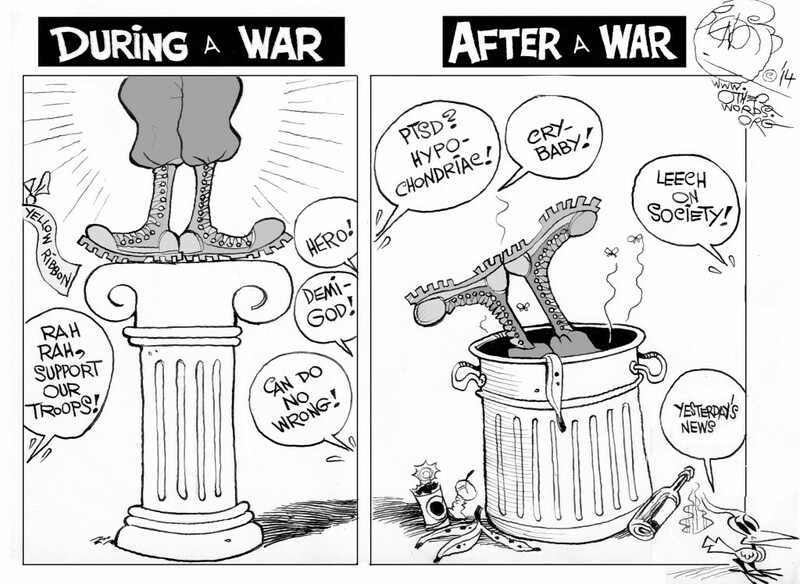 Clearly, Congress and the White House are much better at starting wars than cleaning up after them. Military debates in Washington generally revolve around the costs of manpower, equipment, and logistics. Finding the money needed to cover the medical bills and pensions of veterans is always harder to squeeze into the federal budget. The Pentagon only lists 19,000 troops officially wounded by enemy action in Afghanistan and gives them good care. The other hundreds of thousands with mysterious brain or emotional injuries have to prove it. But first they need to succeed in gaining an appointment at the Department of Veterans Affairs — better known as simply the VA — and demonstrating that they were honorably discharged. William Dolphin, a Purple Heart Vietnam veteran, is now fighting for that right in federal court. The Army gave him a bad conduct discharge years ago for being AWOL upon confusion over where he was supposed to convalesce after leaving the hospital. He’s been suffering from PTSD for four decades. “All I’m asking is that the Army recognize that I served my country proudly,” Dolphin says. There’s another new lawsuit filed in March by a group of Vietnam vets who went through a similar ordeal. It’s seeking class-action status. And things haven’t changed much since the Vietnam War. Washington still sees wasting record sums of money on the F-35 Joint Strike Fighter as a high priority while vast numbers injured veterans go without adequate psychiatric care. At least 55,000 veterans remain homeless despite the existence of dozens of programs that specifically target this problem. If our leaders really want to honor Cory Remsburg, they should stop making people go through what he experienced. It’s time to stop waging unnecessary wars and start taking better care of our wounded warriors. Congress shouldn’t have passed the measure that gives the president wide military powers to pursue al-Qaeda and the Taliban in the first place and 12 years later a repeal is long overdue. Two days after the horrific attacks of September 11, 2001, I was sitting in front of my institute’s office around the corner from the White House. We had just been evacuated again. The police patrolling the streets didn’t have a clue what was going on. So we sat on the curb with red pens, marking up the draft of what would become Congress’s gift to President George W. Bush: Authorization for the Use of Military Force. It should never have been passed in the first place. We put a lot of red marks in that draft. The text abandoned any campaign to bring to justice the perpetrators of this massive crime against humanity in favor of permanent war unlimited by time, borders, targets or victims. The next day Congress passed it almost unanimously – only the brave Congresswoman Barbara Lee, D-Calif., voted no. Read the rest on the US News & World Report Debate Club website, then vote on which writer makes the strongest case for repealing the the Authorization for Use of Military Force (or not). Today is one anniversary that is definitely not cause for celebration. Ten years ago today, President George W. Bush made the fateful decision to launch the unnecessary Iraq War. The consequences of this decision have been overwhelming. A new report estimates that the Iraq War will end up costing American taxpayers at least $2.2 TRILLION, but perhaps as much as $4 TRILLION with interest since Bush put the war on the national credit card at the same he slashed taxes on the wealthy. 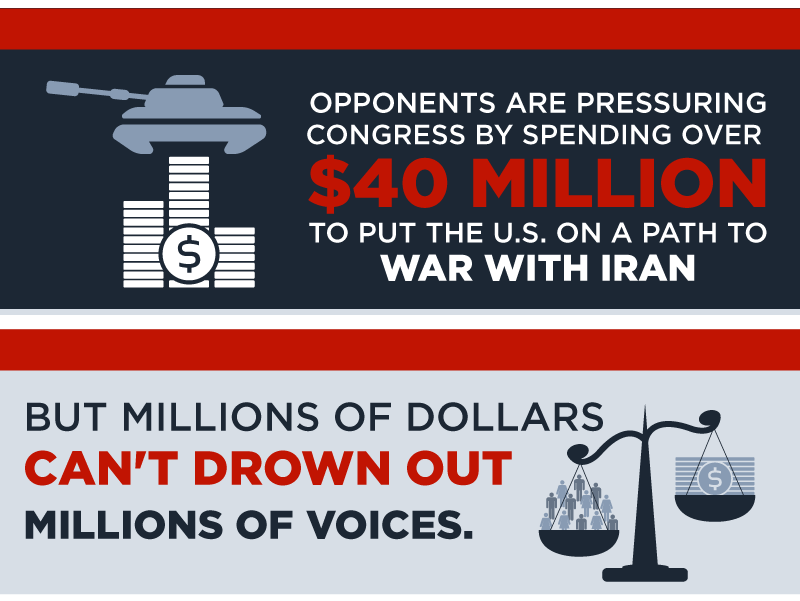 The bill for the war may be large, but the human cost of the Iraq War is even more staggering. It’s estimated that 200,000 people, civilians and soldiers alike, were killed as a result of the war. A million other Iraqis were displaced by the conflict. At the start of the war, the Bush administration predicted that it would cost around $50-60 billion in total. They were wrong by more than a factor of ten, sending the U.S.’ debt soaring, a condition that has yet to be rectified. According to a recent study, the war is set to have cost the U.S $2.2 trillion, though that number may reach up to $4 trillion thanks to interest payments on the loans taken out to finance the conflict. Of that staggering amount, at least $10 billion of it was completely wasted in rebuilding efforts. 2. The physical and psychological strain on U.S. troops. The soldiers charged with fighting the war were stretched to their limits, put through multiple tours, with increasing length of time overseas as the war stretched on and shrinking downtime in between each. All-told, over 4,000 U.S. troops died during the country’s time in Iraq, with another 31,000 wounded in action. In the aftermath, the cost of providing medical care to veterans has doubled, adding to the difficulties faced by those who served. Up to 35 percent of Iraq War veterans will suffer from PTSD according to a 2009 study, while the suicide rate among veterans has jumped to 22 per day. 3. The forgotten war in Afghanistan. Even worse, the war in Iraq caused the U.S. to take its eye off the ball in Afghanistan. Rather than following through, the Bush administration allowed the country to stagnate, prompting a Taliban resurgence beginning in 2004. As the West focused almost exclusively on Iraq, Taliban fighters imported tactics seen in Iraq to great effect, keeping the Afghan government weak and U.S.-led NATO forces on their heels. The result: the United States is still attempting to tamp down on Taliban momentum today. Aside from missed opportunities in Afghanistan, the Iraq War-effort was all-consuming, pulling resources from all other areas of U.S. defense policy. Relationships with key allies were allowed to grow stale and U.S. prestige around the world plummeted. Fighting in Iraq was realized to be a diversion from combating al Qaeda, drawing funding that could have gone towards a litany of other efforts to effectively counter terrorism. 5. The strengthening of Iran and al Qaeda. The power vacuum left after the fall of Saddam and the lack of adequate U.S. forces left room for U.S. adversaries to fill the void. Counter to what some still believe, Al Qaeda had no presence in Iraq prior to 2003. Instead, it was only in the post-Saddam climate that they gained a foothold in the form of Al Qaeda in Iraq. The group continues to carry out attacks against civilians to this day, keeping the Iraqi government on edge. In the end, it was not the United States that gained the most strategically from invading Iraq, but the Shiite-dominated Islamic Republic of Iran. In removing Saddam Hussein’s predominantly Sunni regime from power, the U.S. opened the door to a greater Iranian influence in the region. That influence has been seen playing out counter to U.S. interests in situations such as allowing Iranian planes bearing weapons for Syria to cross Iraqi airspace. Given that we know now that the war was launched on false premises and have witnessed what has happened since, you’d think the architects of the war would at least admit they wrong or express some regret. You’d be wrong. Richard Perle argued in an opinion piece earlier this week that it was still right to have removed Saddam Hussein, even though he had no Weapons of Mass Destruction. Top war architect Paul Wolfowitz acknowledged that things “spiraled out of control,” but blamed others and argued that things would’ve been different if the war had been prosecuted his way (it was, incidentally). It appears that the American people are smarter, or at least more honest, than the neocons who led us into perhaps the worst foreign policy blunder in American history. Polls out this week show that a majority of Americans believe the Iraq War was not worth fighting. 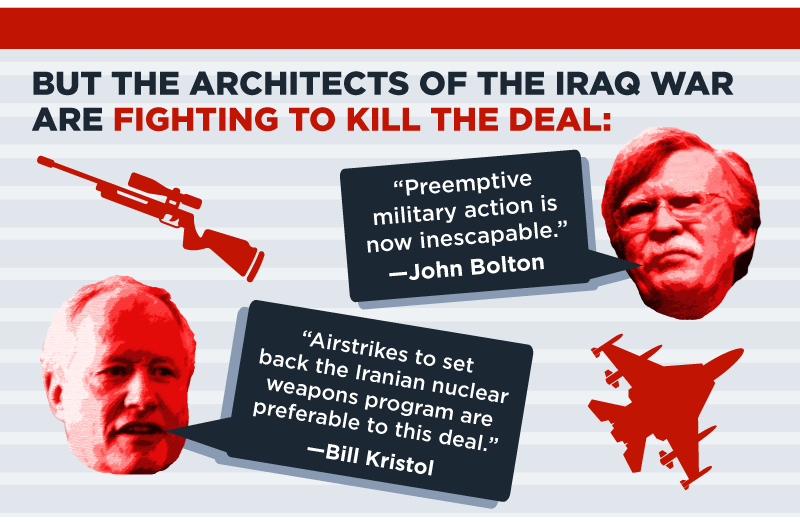 Check out our complete timeline of the Iraq War. For more on the true costs of the Iraq War, please see our updated Iraq War Ledger. How the Iraq War changed everything: the rise of soldiers in popular culture. How the NRA secretly protects people who commit crimes with guns. Chipotle pulls out of Boy Scouts of America event due to conflict with its non-discrimination policy. Four ways the Supreme Court could knock out the Defense of Marriage Act and Proposition 8. Cyprus rejects punitive EU bank bailout. CEOs kick off campaign to lobby for corporate tax breaks, reforms to make offshoring profits easier. Paul Ryan rules out any compromise in fiscal standoff. Bush speechwriter describes the run-up to the Iraq War. The GOP dilemma on immigration.